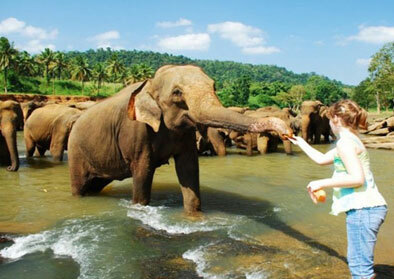 Feel the glamour and the pride of rich culture and history of Sri Lanka. Leolands Heritage Tours Sri Lanka will be a perfect opportunity to explore and get to know about Sri Lankan historic wonders. The representative of Leoland Travels will meet arrival at the Bandaranayke International airport, on arrival clients. Thereafter they will be introduced to the local tour guide / chauffeur who will be accompanied them around the Island. Leave to Pinnawela to Visit Elephant orphanage. * PINNAWELA ELEPHANT ORPHANAGE- App. 55 miles from Colombo, off the Colombo Kandy road is Pinnawela, where an orphanage was started in 1975 to house the abandoned and the wounded elephants. The number of elephants has increased to more than 65 now; including Baby Elephants brought from various parts, as well as some of the more than 25 babies born, as a result of the captive breeding programme. The best time to visit is the feeding time from 0930-1000 hrs and 1330-1400 hrs and the bathing time from 1000-1030 hrs and 1400-1430 hrs when all the elephants are taken to the river close by. Afternoon city tour of Kandy, including Upper Lake Drive, Market Square, Arts & Crafts Centre, Gem Museum and Temple of the Sacred Tooth Relic. Kandy the hill capital, venue of the annual Perahera. The last stronghold of the Sinhala Kings was finally ceded to the British in 1815. Kandy is an example of the Buddhisms influence in Sri Lanka today. Temples shrines and monasteries keeping alive Buddhist traditions are everywhere. TEMPLE OF THE SACRED TOOTH RELIC ever since 4th Century A.D, when the Buddhas Tooth was brought to Sri Lanka hidden from sacrilegious hands in an Orissan princess hair, the Relic has grown in reputation and holiness in Sri Lanka and throughout the Buddhist world. It is considered Sri Lankas most prized possession. Dinner Overnight Hotel in kandy. En-route visit a Spice Garden at Matale and see the luscious Cinnamons, Cardamons, Pepper plants, etc. You can also purchase your requirements of spices. 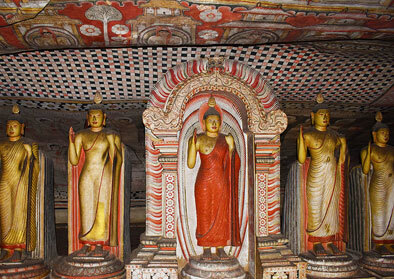 Visit a cave temple in Dambulla. Dambulla Dambulla is famous for the five cave Temples on a rock. The first 03 caves are better, older and larger than the other two. Some caves dates to 1st C.B.C. All the 5 cave walls and ceilings are covered with Buddhist murals and there are more than 130 Buddha statues, statues of Gods and Kings are also found here. 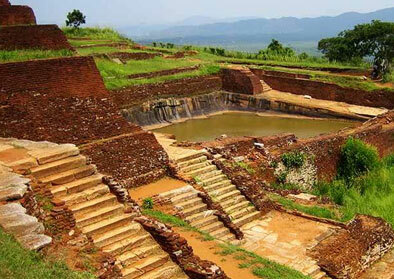 Habarana is the heart of the cultural triangle of Sri Lanka. Located in the dry zone of Sri Lanka Habarana is the center point from which guests could explore the glorious past and the historical myths of Sri Lanka. Culture tourists as well as wildlife enthusiasts are bound to find this location a haven to escape to. Habarana is closely located to the Minneriya and Kaudulla National Parks which are the transit points to hundreds of Asian elephants and other wildlife during the dry season. Dinner Overnight Hotel in Habarana. After Breakfast proceed to Sigiriya. Climb the famous Sigiriya Rock Fortress. Sigiriya is home to the 5th Century Fortress in the Sky which is perhaps the most fantastic single wonder of the Island. It is also known as Lion Rock because of the huge lion that used to stand at the entrance to the fortress. Within its triple-moated defense the huge rock rises almost to a sheer height of 500ft. On its summit are the foundations of what was once a great and sumptuous palace and gardens complete with swimming pool. On one of the stairways the only known ancient work of Sinhala secular painting survived in the form of Frescoes of life sized damsels in all the freshness and delicacy of their original color. Negombo is a modest beach town located close to Bandaranaike International Airport. With a stash of decent hotels and restaurants to suit all pockets, a friendly local community, an interesting old quarter and a reasonable (though polluted) beach, Negombo is a much easier place to get your Sri Lankan feet than Colombo. The Dutch captured the town from the Portuguese in 1640, lost it, and then captured it again in 1644. The British then took it from them in 1796 without a struggle. Negombo was one of the most important sources of cinnamon during the Dutch era, and there are still reminders of the European days. The busy center of Negombo town lies to the west of the bus and train stations. Most places to stay, however, line the main road that heads north from the town center, running almost parallel to the beach. Dinner & Overnight stay at the Negombo hotel.